New Honda HR-V will make its debut at the Geneva Motor Show with sales starting in the summer. Edit by Admin: added picture and changed topic topic title. Good to see a review that is not almost totally negative. Honda needs to compete on price, but no matter how efficient your factory is its hard to match the mass audience advertising and 'build em quick, pile them high' ethos of a company like Franco/Japanese Nissan. Cars like Qashqai (cashcow) and Joke cashed in at the right price on the high seating position that women like so much (look how many women drive Chelsea tractors), but when all cars get equally tall no one is any better off because you can't see over the vehicles in front any more. Wo but when all cars get equally tall no one is any better off because you can't see over the vehicles in front any more. An all-new Honda HR-V arrives in Europe in summer 2015, delivering a unique proposition to the crossover segment: dynamic styling, the versatility of an MPV, sophisticated-yet-fun driving dynamics and fuel-efficient performance. It is part of the updated range of Honda vehicles that demonstrates the brand’s pioneering approach to technological innovation. The HR-V portrays a characterful poise, with the distinctive, boldly sculpted lines of a coupé merged with the tough, solid stance of a robust SUV. Inside, the HR-V offers occupants class-leading space and – thanks to Honda’s innovative Magic Seat ® system – high levels of versatility. High quality soft-touch materials and sophisticated design define the HR-V’s interior, where Honda’s designers married expansive spaciousness with the feel of a sporty, enveloping cockpit. The new Honda Connect app-based in-car infotainment system is operated through a seven-inch touchscreen display in the centre of the dash, and offers access to internet browsing, real-time news, traffic and weather and music streaming services. The new HR-V is available at launch with a choice of highly responsive and efficient 120 PS 1.6 litre i-DTEC diesel or 130 PS 1.5 litre i-VTEC petrol engines, both part of Honda’s Earth Dreams Technology series. The Advanced Driver Assist System package, which employs a camera and mid-range radar, incorporates a comprehensive suite of advanced safety technologies, some of which are new to the crossover segment. 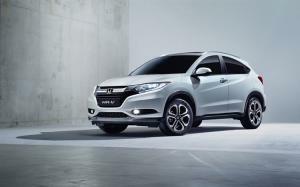 The all-new Honda HR-V will go on sale across Europe in the summer of 2015. The all-new HR-V blends the dynamic personality of a coupé with the tough, solid stance of an SUV, creating a characterful look with emotional appeal. Its body shape and a rear window line that tapers at the rear result in a dynamic and sporty side profile, complemented by ‘hidden’ rear door handles. A distinctive, sharply cut swage line along the bodyside helps to give the HR-V a purposeful, forward-leaning stance and a sense of movement and agility, even at standstill. HR-V also evokes a reassuringly robust presence. Deeply sculpted lower body panels convey the toughness, solidity and sure-footedness of larger SUVs, a theme reinforced by the strong horizontal orientation of the front and rear bumpers. While ensuring the HR-V boasts a distinctive and self-assured identity on the road, its designers also ensured that it bears a clear family lineage. For example, it shares with the new 2015 CR-V the bold ‘flowing wing design’ of the unified front grille and headlamps and the pointed taper of the rear side window line. At the rear, the HR-V continues with the crisp styling theme. Sharp rear combination lights stretch inboard onto the wide tailgate, into which is cut a single boldly sculpted ‘flowing wing’. The all-new HR-V boasts class-leading interior space that is not only voluminous but also incredibly versatile, bringing the virtues of an MPV into the crossover segment for the first time. The foundation of the HR-V’s spacious and versatile interior is Honda’s global B-segment platform which incorporates innovative packaging solutions. For example, a lower-profile fuel tank mounted under the front seats frees up the underfloor space beneath the rear seats, enabling the platform to accommodate Honda’s innovative Magic Seats ® system. Each of the 60:40 split Magic Seats ® in the rear can adopt numerous configurations to maximise the versatility of the spacious interior. In ‘Utility’ mode, the rear seat back folds forward as the seat base lowers to create a long, flat floor. In ‘Tall’ mode, the rear seat base is locked in a vertical position to leave space from floor to ceiling. ‘Long’ mode sees front and rear passenger seat backs fold forward to a horizontal position. Once seated, all occupants benefit from class-leading space with leg-, shoulder- and headroom in the front and rear that would more commonly be found in larger vehicle segments. The boot, too, offers impressive space, with 453 litres* available with the rear seats in use, and 1026 litres* to the window line with the rear seats folded away. A wide tailgate opening and low loading height means the boot space is easily accessible as well as capacious. For occupants, Honda’s designers sought to marry the conflicting themes of spaciousness, reassuring solidity, and the cockpit of a tight, sporty coupé. The use of high quality soft-touch surfaces, subtly accented with brushed chrome highlights provide a premium ambience, while the dash design combines a solid feel with premium detailing, including a piano-black feature panel that emphasises the sense of sophistication. Facing the driver is a three-dial instrument binnacle, the surround of each featuring ‘floating’ illumination rings to further the sense of quality. Honda’s ECO Assist function changes the backlight colour of the speedometer from white to green during efficient driving. The Executive grade also offers owners a one-touch opening tilt and slide panoramic sunroof. A sliding sunshade that opens automatically with the roof and can be closed manually to block sunlight. At the centre of the dash is a seven-inch Honda Connect touchscreen that is fitted as standard on grades above entry level (Sport and Executive) providing advanced connectivity and infotainment. A five-inch screen is available on the Comfort grade. Running Android 4.0.4 operating system, the screen employs the familiar intuitive ‘pinch, swipe and tap‘ functionality of a smartphone. Honda Connect gives fast and easy access to internet-based services including web browsing, real-time traffic, news and weather, social media, and internet music stations. Further apps can be installed from the purpose-designed Honda App Centre enabling owners to personalise their connected infotainment experience, and integrated Garmin Navigation is available. As with all new Honda vehicles sold in Europe, the HR-V is fitted with a number of premium active and passive safety technologies. Comprehensive active safety systems combine data from radar sensors and forward and rear facing cameras. Other than the entry-level model, all grades will be fitted with Honda’s Advanced Driver Assist System as standard. This suite of safety technologies includes Intelligent Speed Assist, City Brake Active Assist, Forward Collision Warning, Lane Departure Warning, Traffic Sign Recognition system, and High-beam Support System. Honda’s City-Brake Active system will be fitted as standard on the HR-V. In addition to a full suite of front and curtain airbags, Honda's proprietary Advanced Compatibility Engineering™ (ACE™) body structure technology provides the foundation for excellent passive safety performance. A network of connected structural elements distributes crash energy more evenly throughout the front of the vehicle, reducing the forces transferred to the passenger compartment, enhancing occupant crash protection in frontal collisions. ACE also helps minimise the potential for under-ride or over-ride situations that can happen during head-on or offset frontal impacts with a larger or smaller vehicle. Available in Europe with front-wheel drive only, HR-V will be offered with choice of highly responsive and efficient 130 PS 1.5 litre i-VTEC petrol and 120 PS 1.6 i-DTEC diesel engines. Each is available with a refined and smooth six-speed manual transmission, and the 1.5 litre i-VTEC petrol can also be married with a smooth CVT automatic. Both engines are part of Honda’s Earth Dreams Technology series, which are engineered to deliver responsiveness and high efficiency, and both are Euro 6 compliant. An all-new 1.5 i-VTEC petrol engine generating 130PS and a 1.6 i-DTEC diesel engine generating 120PS will be available in the HR-V. Both engines will be available with a manual transmission, and the new 1.5 litre petrol engine will also be available with a semi-automatic CVT transmission (with paddle-shift on some grades). The HR-V has been deliberately engineered to deliver a saloon-like driving experience, achieved thanks to its low centre of gravity and its lightweight and highly-rigid body. This rigidity – in great part a result of 27% of the body structure being in high-strength steel – helps deliver reassuring solidity, which in turn leads to a high feeling of security when driving, as well as a lack of body roll. This also delivers exceptional linear driving behaviour, making the HR-V one of the most confidence-inspiring cars in the crossover segment to drive enthusiastically. The HR-V brings class-leading aerodynamic performance to the crossover segment, benefitting not only fuel efficiency but also interior refinement through low wind noise intrusion. To minimise the intrusion of harsh road noise, HR-V employs a highly efficient acoustic insulation package. Sound absorption to the front and rear inner wheel arches, floor carpet and underfloor cover all contribute a refined and relaxing atmosphere in the cabin. Now we have grandchildren in car seats we're finding Jazz a pretty tight fit so HR-V looks really interesting - but my impression that it's a LOT bigger than a Jazz? SIL has a Juke and, as others have said, it feels small inside but outside it seems almost huge. Daughter used to have a Mitsubishi Colt with a sliding rear seat. I believe Nissan Note does that too, and can't help feeling that would be more practical use than the magic seats. Amazing as they are, they're not used much. Beware of equating exterior dimensions with interior space, some car makers (example BMW Mini, Nissan Joke) have large exteriors but internals are quite tiny, rear seats only good for dog or small child, (Mini has tiny 200 litre boot, Nissan Juke pre-mid 2014 had 250 litres, latest ones 350 litres) HR-V has 450 litres boot space, Jazz has about 400 (all boot sizes are with seats in normal upright position), so not much difference between HRV and Jazz in real terms. With sliding seat fully forward Nissan Note manages 11 litres more boot space than Jazz - hardly a deal breaker. I had this exterior / interior space bought home to me when we were in USA a few years ago and were picked up in a Cadillac - Huge long bonnet (sorry Hood) and long Boot (Trunk) - but boot was very shallow - but the biggest surprise was the passenger cabin, I'm not the tallest person in the world but my knees were only and inch or two from back of front seat. Honda Jazz is much smaller externally, does many more miles per gallon, but has much more useable space - no wonder Americans like it so much. Honda make some of the most roomy interiors with smallest externals, 'Man maximum, machine minimum' I think they call it. One thing I do like about HRV is that it has rear armrest, which passengers seem to like, is any UK spec Jazz fitted with one? I quite like the HR-V, I would certainly consider one in the future. Interesting if they put the 1.6D engine in it, I think that would make a very economical vehicle, so long as the EC keep their fingers out of taxation, joke. As to the magic seats, I use them all the time, allow me to carry so much stuff that I could not get into lesser cars than the Jazz - and I can keep the boot discrete for carrying items I don't want on show. One thing I do like about HRV is that it has rear armrest, which passengers seem to like, is any UK spec Jazz fitted with one? Our 2009 EX has a rear armrest - granddaughter sits her cuddly toy on it! I was quite dismayed to find it's gone on the 2014 EX our daughter recently got. I quite like the HR-V, I would certainly consider one in the future. Interesting if they put the 1.6D engine in it, I think that would make a very economical vehicle, so long as the EC keep their fingers out of taxation, joke. I run a diesel car myself, but I'm doing long, often 400 miles ish, round trips in a day. For the rest of our family "fleet" I've shied away from disels, as they really need a decent run to get warm and need a good motorway speed run weekly to clean the dpf. I don't know - some people use them for town / urban use and say they're fine, others have no end of problems. We nearly bought the 1.6 diesel for our Golf mk6 but EGR failures at £1000 are becoming a regular occurance. We are confident that the HR-V will perform favourably against its main competitors in this segment, such as the current market leading Nissan Qashqai.” Commented Leon Brannan, Head of Car, Honda (UK). I thought the HR-V is a Nissan Juke rival? HR-V is bigger than I think people are expecting it to be - it's longer than Juke and almost as long as Qashqai. It's taller than Qashqai but not quite as wide. It's width which can be a real pain in these (well, all, I suppose) vehicles these days as parking spaces are getting so tight.